These granny square slippers are so fun. They are not traditional granny squares, but granny squares with a circular middle to keep your feet toasty warm. I've heard that it's better for your carpet if you don't go around barefoot, because the oils from your feet get on the carpet. So what better way to protect your carpet then these cute little slippers. 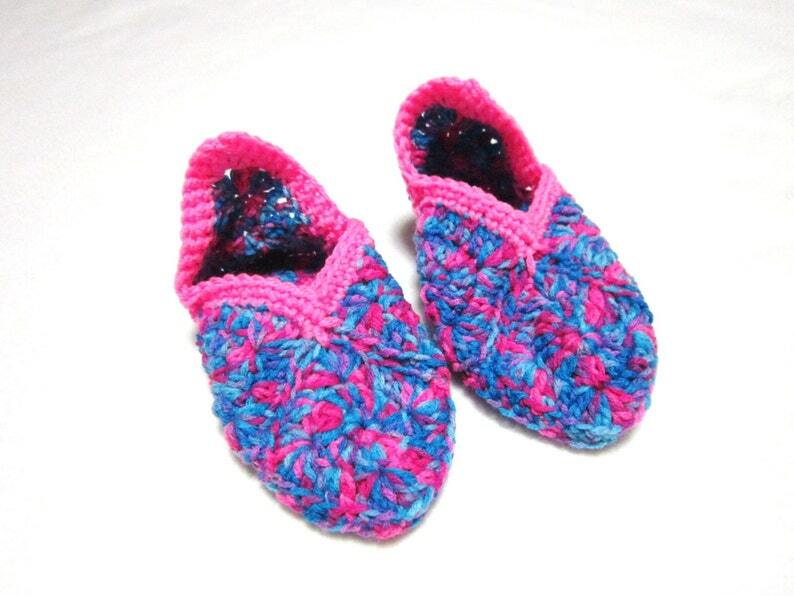 Crocheted from varigated yarn that is a mixture of pinks and blues colors, they are so cute. I've added some bright pink trim to make them more secure on your feet. They can also be worn with socks for extra warmth. They are 8 inches long. They should fit a size 5 to 6 womens shoe size or a size 3-4 in girls. They are machine washable and dryable and should hold up for a long time. It is preferred that you wash them in gentle cycle. Maybe you know an older person who is in a nursing home who is cold all the time. Buy these for her and she will thank you. Or start your Christmas shopping early. It's never to early to shop for Christmas. Like the look of these slippers, but you'd prefer them in a different color, or need a different size. Just convo me and I'll be happy to make a custom pair for you. Please take a peek in my shop. You'll find lots of goodies there. As with any socks, you should be careful wearing them on tile or wooden floors.